Coaching people who want to make a difference through non-profits and special projects. We’ve been talking about how to honor and celebrate our 40 year wedding anniversary (which we cannot even believe we are saying “forty”). We originally thought we would take 40 days off (one for each year), but that did not work out with our work schedules. 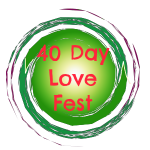 So we grew that idea into creating the “40-Day LoveFest,” which will consist of doing something special each day for 40 days to celebrate these 40 magical years, including taking time each day to remember the years, the ups and downs, the memorable moments and more! 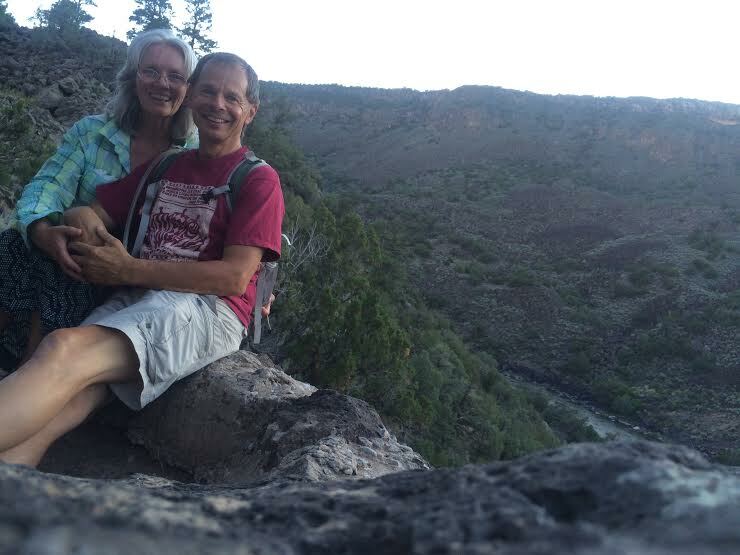 Helene and Dave on July 10, 2016 in Wild Rivers National Monument in northern New Mexico. Looking back on those forty years, the statement by Annie Dillard, “We do not remember days, we remember moments,” rings true for us. 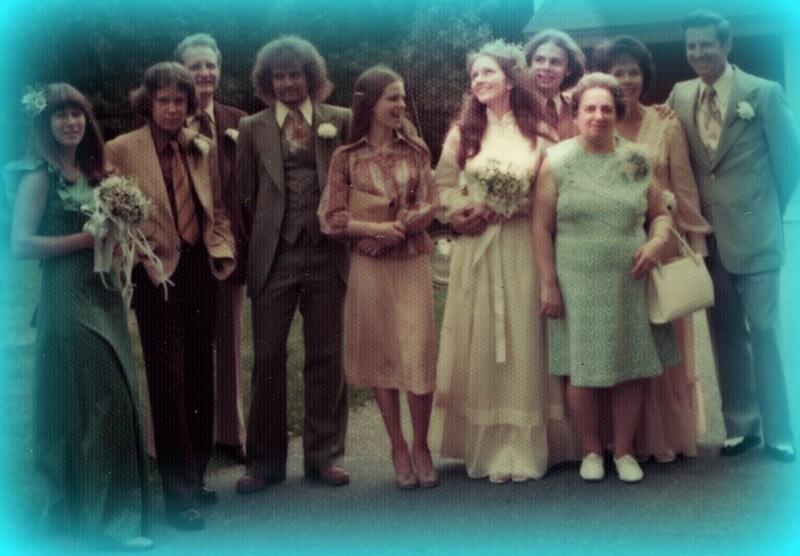 We got married as kids in Queens, New York (Dave was 20, Helene 17) on July 10, 1976 – a bicentennial wedding. A few days later, we headed West in a Chevy van to find our place to live the life of our dreams. Our wealth is our shared lives, our family, our love for the natural world, our mountainside home, and the wonderful work we have been able to do. It all is centered on making our day-to-day actions reflect our shared value of “making a difference”. Leaving NYC and settling somewhere in the West was a dream-come-true in and of itself; since then we have had many many other dreams come true. What a beautiful way to honor your marriage. You are such an inspiration to many of us. My life is fuller because you are in it! May God bless you always. Love. Thanks much Cyndi…you know the way of love with your Beloved. We are lucky people huh? Exploring your paths in life together and following your dreams as a couple is so exhilarating to me. Thank you both for sharing your life with so many of us. Wishing you much health and happiness in the next 40 years! Thanks Lalena for your comment. Sharing one’s life with another makes for a beautiful life path. Especially when you have shared values and join forces to make a life of goodness. Absolutely wonderful! Congrats on being an example for us and we cannot wait to hear your story in the upcoming adventures in love! Thanks Jeanette….it’s fun sharing what has worked for us knowing that every couple is different…creating their own way. You two are so inspiring! One of the best things about your marriage that I can see is that you reflect your love for each other to all of those around you!! Thanks for sharing your positive energy, spirit and of course love with all of us!! Happy Anniversary!! yes photos are great but the stories and nuances of what has unfolded and how you loved that are the precious gems. Thanks so much Marge. We feel lucky to have found each other. And it’s great having you in our inner circle of support and love through the many seasons.